The purpose of this Sample Question Set is to provide you with information about the EC-Council Security Analyst (ECSA) exam. These sample questions will make you very familiar with both the type and the difficulty level of the questions on the ECSA certification test. To get familiar with real exam environment, we suggest you try our Sample EC-Council ECSA v10 Certification Practice Exam. This sample practice exam gives you the feeling of reality and is a clue to the questions asked in the actual EC-Council Certified Security Analyst (ECSA) certification exam. These sample questions are simple and basic questions that represent likeness to the real EC-Council Security Analyst exam questions. To assess your readiness and performance with real-time scenario based questions, we suggest you prepare with our Premium EC-Council ECSA Certification Practice Exam. When you solve real time scenario based questions practically, you come across many difficulties that give you an opportunity to improve. 02. Which one of the following acts makes reputational risk of poor security a reality because it requires public disclosure of any security breach that involves personal information if it is unencrypted or if it is reasonably believed that the information has been acquired by an unauthorized person? 03. A security policy is a document or set of documents that describes, at a high level, the security controls that will be implemented by the company. Which one of the following policies forbids everything and restricts usage of company computers, whether it is system usage or network usage? 04. You work as an IT security auditor hired by a law firm in Boston. You have been assigned the responsibility to audit the client for security risks. When assessing the risk to the clients network, what step should you take first? 05. TCP/IP provides a broad range of communication protocols for the various applications on the network. The TCP/IP model has four layers with major protocols included within each layer. Which one of the following protocols is used to collect information from all the network devices? 07. Identify the policy that defines the standards for the organizational network connectivity and security standards for computers that are connected in the organizational network. 08. A framework for security analysis is composed of a set of instructions, assumptions, and limitations to analyze and solve security concerns and develop threat free applications. Which of the following frameworks helps an organization in the evaluation of the company’s information security with that of the industrial standards? 09. Which one of the following acts related to the information security in the US fix the responsibility of management for establishing and maintaining an adequate internal control structure and procedures for financial reporting? 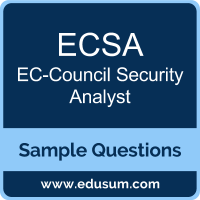 Note: For any error in EC-Council Certified Security Analyst (ECSA) certification exam sample questions, please update us by writing an email on feedback@edusum.com.